OH MY GOD HOW HAVE I NOT HEARD OF THIS BOOK BEFORE?!? Can I just stop for a minute and say thank you to Amy Engle for writing a dystopian world where there’s no definite “good guys” and “bad guys”? That she took the time to write about a consistent world and consistent characters? I usually stray away from dystopia and the whole “someone who must kill the guy that’s from the enemy side but finds out that they’re good instead” kind of thing. Basically, since I had no expectations from this book, you can imagine my surprise at how good this was. Ivy Westfall is a character that is not happy. She has to marry the President’s son to continue the line of girls and boys having to marry so that there’s peace between the two sides. 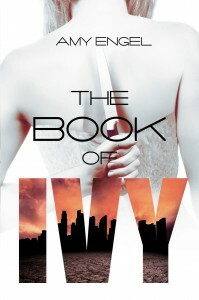 Obviously not everyone is going to love The Book of Ivy since I’ve heard a bunch of things about this book. It had a pretty predictable plot, but that doesn’t mean that there’s not political intrigue or parts of the story that make you want to continue flipping the pages! I want to be someone strong and brave enough to make hard choices. But I want to be fair and loving enough to make the right ones. I’ve already said that I appreciate the world in this book for being consistent, but I also really like Ivy’s character—despite how frustrating she was towards the end. But I really like her, she’s much better than some heroines I’ve read about this year anyway. AS SOON AS IVY OPENED HER MOUTH ABOUT THAT SELF SACRIFICE STUFF I ALMOST WANTED TO DIE!!!! Overall, The Book of Ivy has a pretty decent main character, a believable world without a completely dominating government, a guilt-pleasure romance, and THE WORST CLIFFHANGER EVER. So read this if you want a quick read (but make sure you have the next book…).